Now at its 'masculine best', the top-spec Audi TT RS has been updated for 2019 with dynamic styling. Audi has officially released images of the updated 2019 Audi TT RS Coupe and Roadster which perhaps gets the most aggressive front-end design in the compact sports car's history. 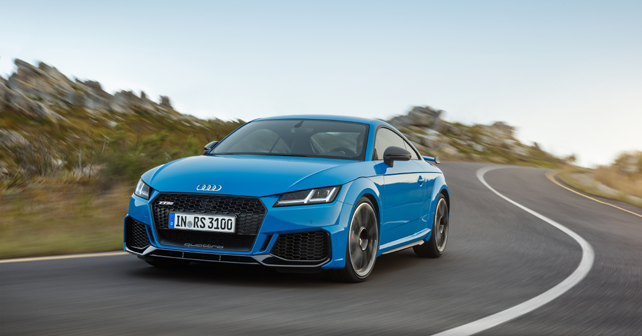 Dynamic styling coupled with Audi's 'International Engine of the Year' award-winning 2.5-litre five-cylinder TFSI ensures that 'The new TT RS is in absolute peak form,' as exclaimed by Michael-Julius Renz, CEO, Audi Sport GmbH. Designers claim that the 2019 TT RS is the most masculine and dynamic looking TT in its history. A completely redesigned front end now features a gloss black honeycomb-mesh grille encased in matte-black, Quattro-labelled frame. Further, lateral air inlets have been enlarged and now extend back to the front wheel wells to give the front a wider stance. A continuous front spoiler runs through the lower end of the bumper, flanked by air inlets on either side, which further house additional radiators for effective cooling. While LED headlights remain a standard offering, the car can be ordered with optional Matrix LED headlight units and Matrix OLED reversing lights. At the rear, a newly-designed, fixed rear wing with side winglets becomes the centre of attraction. Audi's coveted 2.5-litre five-cylinder motor continues to power the new TT RS which can sprint from 0-100km/h in just 3.7 seconds. The motor produces a whopping 394bhp and 480Nm of torque. Despite the fact that its closest competitor, the BMW M2 Competiton, has more power and torque at its disposal (405bhp and 550Nm), the M2 is slower than the TT RS in a 0-100km/h sprint (4.2 seconds). This difference can be attributed to Audi's seven-speed S-Tronic transmission mated to the Quattro full-time AWD system. The 2019 TT RS continues to be a four-seater. It gets a 12.3-inch screen, part of the Audi Virtual Cockpit setup, which plays host to the numerous RS displays like the G-force meter, etc. Infotainment services are led by features like the MMI navigation plus, voice control, Wi-Fi hotspot facility and multiple smartphone connectivity modes to the Audi Virtual Cockpit. The car features a 680W Bang & Olufsen sound system. Audi will open the order books for the new TT RS from 7th February 2019 and the cars will reach dealerships across Europe in Spring 2019.